Mississinawa Valley’s Sidnie Hunt slams one across the net against Twin Valley South on Thursday night. The Blackhawks won the Cross County Conference match 3-1. Mississinawa Valley’s Olivia Murphy played a strong game for the Blackhawks on Thursday night at Twin Valley South. 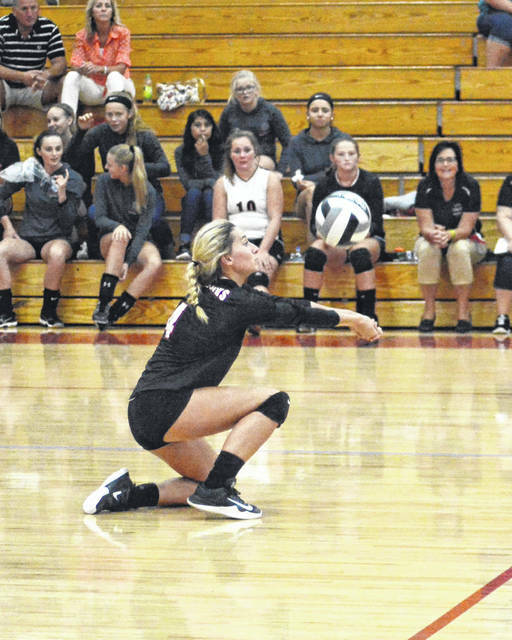 The Blackhawks lost the first set, but rallied to win three straight in taking the overall match victory over the Panthers. 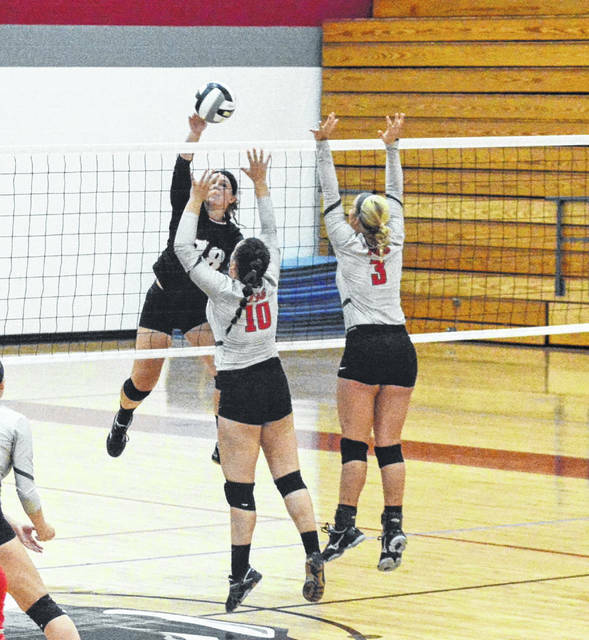 WEST ALEXANDRIA – After allowing Twin Valley South to win the first set, the Blackhawks managed to win the next three sets to capture a Cross County Conference victory against a quality opponent. But as we shall see, the Blackhawks did it in fashion likely to give Coach Billie Hunt a cardiac arrest. But when the team needed points, it was the seniors on the squad that stepped up and made plays. The scoring was 24-26, 25-16, 25-21, 25-22. The service of the Mississinawa Valley Blackhawks was a big factor in the first set. The team got a lot of aces from Sidnie Hunt and Taylor Stachler. South adjusted some to the strong service later in the match, but it was definitely a factor in the first set. The Blackhawks had a slim 22-19 lead, but after a South time out the team seemed to lose momentum and South surged ahead for the win. In the next two sets, the Blackhawks inexplicably started slowly allowing South to get an early lead, so the Blackhawks had to play catchup. It had to be exasperating for the coach to have the team start so slowly and have to regain momentum. In the second set after knotting the score at 11-all, the Blackhawks made their move. The combo of seniors Hunt and Olivia Murphy captured and then extended the lead for a solid win. In the third set, the Blackhawks seemed determined to give it away. They started sloppy and at one point had three bad serves in a row – all of their momentum had been frittered away. But Murphy had an ace, Hunt had a block and a kill and suddenly the team was back in business with new energy and they were able to go on a run and capture the lead. When South made a move late to try and catch up, it was Murphy who had a block, then two kills in a row to extend their lead and the team was able to pull away for the win. In the last set it appeared that the bus driver could walk out early and get the bus warmed up for the trip home. The team got off to a strong start this go around and seemed to take charge of the game. But with a 19-11 lead the team lost control and allowed South to go on a 8-1 run. This time coach Hunt had seen enough and took a timeout. Despite a couple of bad serves, the Blackhawks got back on track after the timeout and were able to put South away and make that long bus ride home shorter with a quality win. This entry was tagged CCC, girls volleyball, Mississinawa Valley Blackhawks, Twin Valley South Panthers. Bookmark the permalink.